Recently, Jess and I were invited to spend a long weekend in Grand Falls-Windsor, Newfoundland thanks to Adventure Central Newfoundland. One of the main events we were invited to attend was white water river rafting with RaftingNL. Loving a new experience and adventure, we were so excited - and it was so much fun! We took the Badger Chute trip, offered by Rafting NL,which is perfect for any beginner. No experience is required and anyone over the age of five can do it. This trip can take between four to six hours and leaves at 11:30am or 4pm. We took the am tour and it was perfect. The weather was beautiful and the water was warm. Throughout the run you have lots of opportunities for swimming, splashing the other rafts, and jumping into the water. At one point, there was a chance to jump off of a rock face into a rapid and feel its strong current pulling you through the river. Of course it was a nerve wracking jump, but the experience was so worth it! It was a truly unique opportunity and I would do it again in a second. We were very fortunate to have a beautiful day for our tour, however, if it's a bit cooler they do have wet suits you can wear! This tour takes you over lower level rapids and some more leisurely rafting. It includes a picnic lunch on a small island and the guides take plenty of pictures throughout your trip so you don't have to worry about bringing a camera! It's worth mentioning that the guides that took us out were amazing! They made the trip super fun and you will not be able to wipe the smile off your face. It truly was an unforgettable experience! The team at Rafting NL have other tours you can check out as well (which Jess and I will totally be going back for). They have the Canyon Run which they describe as "perfect for thrill seekers", this tour doesn't require any experience either, but you must be comfortable with water. The waves are much higher and the rapids more intense. Of course, the guides will run through all of the safety information necessary for river rafting, which will help you feel more comfortable with the higher level rapids. 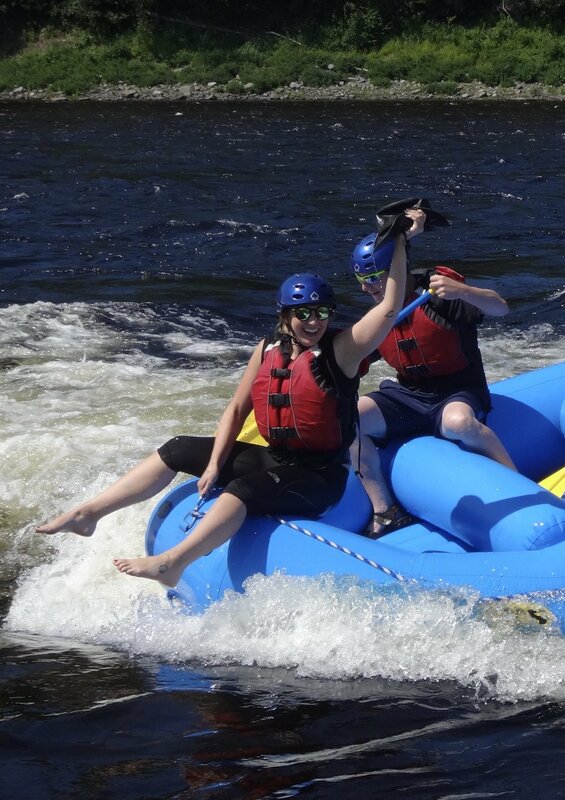 They also have the Beothuk Nature float which is the perfect for anyone who is not comfortable in the water or is looking for a more calming tour of the Exploits River. It is a relaxing tour with no rapids and paddling is optional! This option is great if you happen to go early in the season as it doesn't require you to get into the water, so you can avoid the cold! We highly recommend doing a white water rafting trip with Rafting NL! The Exploits River in Grand Falls-Windsor is a stunning place to try out something new and gain an experience you won't soon forget. You can find out more about rafting from the Rafting NL website or from Adventure Central. There are some many amazing things happening in central Newfoundland and this is definitely a must do if you're in the area. Finally, check out these happy tired faces once we finished our tour and immediately started planning our return to check out the Canyon Run.